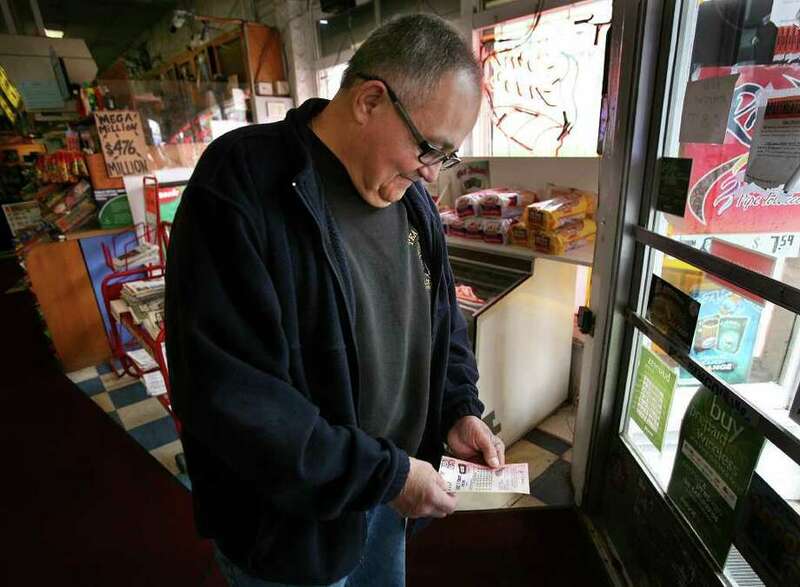 Pedro Vega of Stratford looks at his ticket numbers after purchasing five entries in the Megamillions lottery at Martin's News on Barnum Avenue in Bridgeport on Thursday, March 29, 2012. Got your Mega Millions ticket? You have plenty of company. By midday Friday, the Mega Millions lottery's website reported the jackpot had ballooned to $640 million -- and counting -- as a last-minute crush of players sought to cash in on the record-breaking payout. The midday jackpot had swollen $100 million from the amount posted a day earlier, and could be expected to grow even larger as the ticket-buying frenzy continued before the cut-off at 10:45 p.m. Friday. The lottery drawing will take place at 11 p.m. Friday. "Everybody is buying a lot of tickets," said Nicoleta Malacea, who was operating the lotto machine at Discount Corner in downtown Bridgeport. "We have customers who usually play the daily numbers, but today, it's Mega Millions. That's what they want." The lottery prize closest to Friday's jackpot was the $390 million Mega Millions payout of March 6, 2007, won by a buyer in Georgia and another in New Jersey. "I buy four numbers," said Al Dullivan, 78, of Bridgeport. "Always four. Never more. If I win, I'll help out my friend, who just told me that he's not doing too well." The prize attracted people who almost never play the game. "I don't usually play lotto," said Aida Gomez. "But I found out this morning that it's a half a billion dollars." Gomez was buying tickets for her office pool. "I work at Unicare on Canon Street (in Bridgeport), and there are eight people in our pool. Two dollars each, and I wrote everybody's name, and we're going to make copies for everyone, and we're going to win," she said. A co-worker, Natasha Campbell, accompanied Gomez. "If we win, I'm off to Italy," she said. In Stratford, Pedro Vega had just bought five numbers at Martin's News & Cigarette Outlet on Barnum Avenue. "If I win, I'll help out all of my friends," he said. On the East Side of Bridgeport, Ebony Harper was out buying tickets for the 34 in her office pool. "All it takes is one number, and we all win," she said. "Even the boss and his wife are in it, I think." Connecticut Lottery spokeswoman Linda Tarnowski recommended not waiting until the last minute to buy tickets. "Obviously, this is the largest jackpot that we've ever had, so we're telling people to play responsibly," she said. "Everything is running smoothly, and we're selling about 2,200 numbers an hour." Despite the hype, your chance of winning is exceedingly tiny. First, you have to pick five numbers out of a pool of 56, and then you have to get the "Mega Ball" number, of which there are 46. So, the odds of winning are less than 1 in 175 million; 1 in 175,711,536, to be exact. Even if you correctly guess the first five numbers, but miss the Mega Ball, you'll have to be content with a prize of $250,000, and live out your life knowing that you were just one number away from Easy Street. Experts recommend office pools be conducted with care, and that careful records be kept of who's in the pool. Also, copies should made of the tickets purchased. Disputes often occur when the person buying the tickets buys more numbers for himself, and one of those hits it big. $24 million Mega Millions prize. Lopes claimed the winning number was his alone, but a jury thought otherwise. The workers had been in a pool since 2007. At the time, they worked for Berto Construction Inc. in Elizabeth, N.J. After the trial, Lopes said he was "robbed" by his co-workers. In August, 22 co-workers at a kitchen cabinet factory in Youngstown, Ohio, shared in a $99 million Mega Millions payout. They were sued by another worker, Edward Hairston, who claimed he was regularly in the pool but was out sick the day the money was collected. His co-workers, meanwhile, said Hairston isn't entitled to a dime because he had been out sick for three months. That case is still in court. Bridgeport lawyer Lou Zowine said all of it could have been avoided had the "friends" in this pool had photocopies of the lottery tickets purchased, as well as an agreed-upon list of names of the people who pitched in. "It's an agreement," he said. "And if someone says later that they belong to the pool, but didn't pay that week, well, they're not part of that agreement." The love of lottery money is even stronger than the love that binds family members. Just ask sisters Rose Bakaysa, 87, and Theresa Sokaitis, 84, who stopped speaking to each other after Bakaysa won a $500,000 Powerball jackpot in 2005. Sokaitis said she had a long-running agreement with her sister to split their gambling winnings. But it came out in the trial that the sisters had an argument over a few hundred dollars in 2004, and a state Superior Court judge in New Britain ruled on May 12, 2010, that Bakaysa didn't have to share her jackpot. If you're a business owner, what should you do if just about everyone in your company barges into your office singing the Johnny Paycheck anthem, "Take This Job and Shove It," after hitting it big? "I would try to turn a negative into a positive," said Fairfield University business professor Jeffrey Roseman, who also owns two jewelry stores. "I wouldn't hide the fact that my staff had won the lottery and had left me because people have a natural curiosity about a situation like that. They might want to work at the place where a half-billion dollars was won," he said. He said with the help of headhunters and temp agencies, "it should be possible to weather the crisis." Mega Millions has been around since 2002, replacing another multistate lottery, The Big Game. It is played in 42 states, plus Washington, D.C., and the U.S. Virgin Islands. Connecticut added the game to its lotto lineup on Jan. 31, 2010, after the Multi-State Lottery Association agreed to allow states to join both Mega Millions and the other big multistate lottery, Powerball. The Mega Millions drawings take place in Atlanta.